An illuminated manuscript called for a whole team of craftsmen: the parchment maker, the gold-beater, the pigment maker, the scribes and miniaturists. In the Middle Ages and the Renaissance, a book was truly a labor of love. 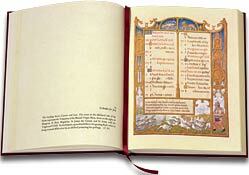 Many books, especially illuminated manuscripts, could be years in the making. An illuminated manuscript called for the tremendous skills and painstaking labors of a whole team of craftsmen: the parchment maker who turned calf pelts into sheets of vellum, the gold-beater who hammered ducats into microscopically thin leaves of gold, the pigment maker who ground plants and stones into beautiful colors, and finally the scribes and miniaturists who covered the parchment with exquisite lettering and resplendent illustrations. Private ownership of this type of manuscript was obviously somewhat limited. 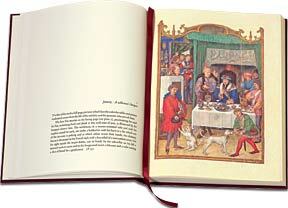 But if you were prosperous enough, chances are that you owned a Book of Hours, the most numerous and popular of all manuscripts from the fourteenth and fifteenth centuries. Intended for private worship in the home, Books of Hours were collections of prayers to be recited at prescribed times throughout the day, the eight canonical “hours” that ran from Matins at daybreak to Compline at bedtime. Strictly speaking, only the clergy was required to observe the hours, but many lay people, especially women, likewise made it their custom to pray eight times a day. 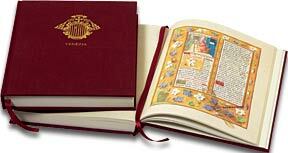 Some of the wealthiest and most powerful rulers in Europe commissioned breviaries for themselves, including King Philip IV of France and Queen Isabella of Castile. One of the masters who completed the Isabella Breviary in the 1490s was the Flemish painter Gerard Horenbout. Around the same time, Horenbout and his collaborators were working on another manuscript, equally spectacular: the masterpiece known as the Grimani Breviary. It is not known who commissioned it, although Pope Sixtus IV, who reigned from 1471 until 1484, is sometimes mentioned as a candidate. The attribution is not far-fetched, considering that Sixtus was not only a Franciscan scholar (the Breviary follows the Franciscan Office, or daily prayers, of 1477) but also a great patron of the arts. The Grimani Breviary begins the calendar year with a nobleman enjoying a sumptuous dinner as his team of servants hover helpfully. His expression is so lifelike and the details so exact that the picture cannot be anything other than a portrait from life. 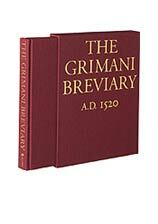 Perhaps the best clue about the original patron of the Grimani Breviary comes at the beginning of the manuscript. Miniaturists often inserted portraits of their patrons into Breviaries and Books of Hours. The Grimani Breviary begins the calendar year with a nobleman enjoying a sumptuous dinner as his team of servants hover helpfully. His expression is so lifelike and the details so exact that the picture cannot be anything other than a portrait from life. Such scenes of everyday life show how breviaries and Books of Hours could be appreciated on a secular as well as a religious level. Their illustrations possessed, of course, an important devotional function. Yet there was also a more whimsical side to manuscript illustration. Illuminated manuscripts often included in their margins what were known as drôleries, humorous and sometimes grotesque images seemingly at odds with the rest of the text. One of the greatest pleasures of the Grimani Breviary is the wonderful range and variety of this kind of decorative marginalia. These images display, like the wealth of incredibly rich detail throughout the Breviary, an unmistakable delight in the natural world and a joy in the artist’s ability to create. The officials of the Basilica of San Marco, who ultimately took possession of the Grimani Breviary on behalf of the Republic of Venice, were in no doubt about its beauty and worth: “It is a thing of inestimable value and its like is nowhere to be found.” Five hundred years after its creation, it is still every bit as priceless. © 2007 Ross King. Excerpted from the foreword to the Levenger Press edition of The Grimani Breviary, published in 2007.